It may seem strange to be writing a review of a camera that was first launched in 2007, but the 1Dmk3 is still a very good camera, and, selling as it does on the used market at around U$D 1300, it still represents a viable option to some of the newer Canon bodies. To better understand why the 1DMk3 has lost a lot of its value over time, it is necessary to go back to the time of its introduction. When the 1Dmk3 was launched, it replaced the 1DMk2 and1D Mk2n. Both versions of the 1DMk2 were state of the art sport and wildlife cameras, and at that time were rated by most to be the best in class. The Mk3 was upgraded in almost every respect though, and Canon might have been forgiven for thinking that they had things covered. The camera was a far more advanced machine compared to the earlier versions, and featured twin Digic 3 processors, a ten megapixel sensor with a crop factor of 1.3, ten frames per second speed, large buffer, new battery, new autofocus module, new rear LCD, Live View and highly tunable autofocus setup. This was also the first 1D Canon to be fitted with the rear AF (autofocus) joystick which made AF point selection quick and simple. It should have all gone smoothly from there, but trouble came in two different forms. The first thing to happen was that some Mk3 bodies suffered from autofocus troubles. There were a series of firmware upgrades, and eventually a hardware upgrade (affected cameras had to go back to Canon for a free repair/adjustment to the mirror box). 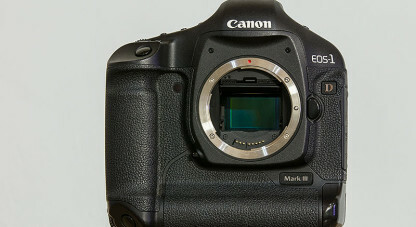 Although Canon eventually got the problem cameras fixed, and offered a free check of all 1Dmk3 bodies, some damage had been done to the cameras reputation and all kinds of complaints were registered by folk happy to jump on the complaints bandwagon. The second blow for the 1Dmk3 was the launch of Nikon’s superb D3 camera body, which was designed to topple Canon from the top of the sport and wildlife camera position it had long occupied. The D3 featured superior low light performance, accurate and reliable autofocus, higher resolution and it put Nikon back in this market in a big way. Droves of photographers switched from Canon to Nikon. So although the 1Dmk3 suffered on internet forums, and it was outshone by the Nikon D3, it remained a rock-solid camera that today can be found on the used camera market at a very reasonable price. Used 1Dmk3 bodies can typically be bought for a little less than a new Canon 6D full-frame body and around the same money as a new Canon 70D. If you can find one in good condition, a 1Dmk3 still offers a lot to the right kind of user. The 1Dmk3 has a very tough, well thought-out body. It instantly feels comfortable to hold, and the contoured grip makes holding this heavy camera (1.335Kg) easier than you would expect. There is no mode dial and instead, a button activates the mode menu. This is a huge plus for me, as I frequently used to bump the mode dial on my 5Dmk2 or 7D when removing them for use from my camera bag. With the 1Dmk3, I no longer miss shots due to accidentally bumping the camera into Manual or some other unexpected mode. The viewfinder is big and bright, and provides approximately 100% coverage at 0.76x magnification. There is a built-in eyepiece shutter that can be set to block out light from entering the camera when one is shooting long exposures at night. A second shutter button and control set are mounted on the bottom of the camera body for vertical shooting. They can be switched off to avoid accidentally triggering the shutter. Most of the camera body and its inner covers are made from magnesium alloy, which is light but very strong. The camera has seals and O-rings wherever moisture might enter the body, and is weather resistant when used with a suitably sealed Canon EF-L lens. You instantly get the idea when you pick up this camera that it is made to go the distance. The shutter is rated for 300 000 cycles, which is a lot. The rear LCD screen is 3.0 inches in height, matching the latest offerings from Canon, though the resolution is only 230 000 pixels, which is low by modern standards. The brightness of the screen can be set. 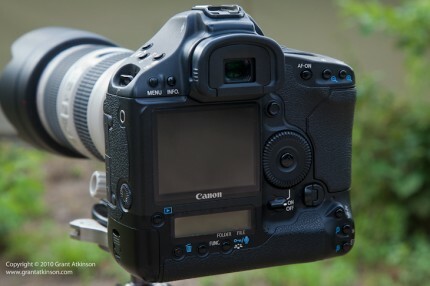 While the camera is ready to shoot, you can press the INFO button to display the camera settings on the LCD monitor. There is also a second screen below the main LCD, which shows information about cards, white balance and quality settings. The camera can be used in Live View mode quite easily, just by pushing the Set button. The Mk3 has two card slots underneath its locking card door, one for a CF card, and one for an SD card. It can be set to shoot to both cards at once, or switch from one to another upon filling up. There are other options as well. The menus on the camera run deep, and there is a lot of options for setting up the camera to suit different user styles. These include creating your own menus, with your most frequently used menu options prioritized. It is also possible to save groups of settings that you use often as named presets, for easy and quick recall whilst shooting. For the purposes of field testing and for all my wildlife photography, I shoot the camera set to the RAW quality only. As a wildlife photographer, I am looking for great image quality, high-performance autofocus, and ease of use in a camera. The 1DMk3 meets these requirements although it is low in resolution by 2014 standards. I always shoot in RAW and process my images using Adobe Camera Raw and Photoshop CS5. I made use of only Canon lenses on my copy of this camera, and shot it with the following lenses attached: EF16-35 f/2.8 II, EF70-200 f/4.0L, EF70-200f/4.0L IS, EF70-200 f/2.8 L IS version I and version II, EF300 f/2.8 L IS. The 1Dmk3 has superb image quality and the files display good contrast, sharpness and detail. On screen the images are visibly superior to anything coming from any of the APS-C (1.6x crop) Canon camera bodies. When making large prints the higher-resolution cameras like the 7D and even more so the 70D win back some image quality. At ISO settings up to 400, the images are extremely clean. Going up in the ISO range, 800 provides very good results, and even ISO 1600 remains perfectly usable, even for print even though some noise is visible and it may require some attention in processing. At ISO3200, it becomes necessary to post-process carefully to remove noise from the images, but they still remain usable at smaller print or display sizes. I turn off Long Exposure NR (C.FnII:1 set to 0), disable the in-camera High ISO speed noise reduction (C.FnII:2 set to 0), and also disable the Highlight tone priority (C.FnII:3 set to 0). My reasoning is that since I am shooting in RAW most of the time, I prefer to do those processing steps myself afterwards. By turning off those actions it means they are no longer applied in camera to the jpeg thumbnail that the camera creates for the rear LCD display, thus freeing up the processors. The camera has a sensor which is midway in size between the smaller APS-C sensors found in the Rebels, 60D series and 7D, and the full frame sensor in the 5D series and 1DS series cameras. The sensor in the 1Dmk3 measures 28.1 x 18.7mm and is classified as an APS-H sized sensor. Canon no longer market any new dslrs using an APS-H sensor size. The APS-H sensor gives an effective field of view crop equivalent to a factor of 1.3x. What this means is that a 300mm lens shows a field of view roughly equivalent to 390mm on the 1DMk3. Of course, the actual size of the subject that falls on the sensor is determined by the lens focal length alone. One benefit of the sensor being slightly smaller than a full frame sensor is that the edges of the image that the lens projects are not used. This means that one does not have to deal very much with vignetting, which is normally visible on the corners of the image. Of course for landscape photographers, this sensor size means that their wide angle lenses become a bit less wide, not always a desirable change. 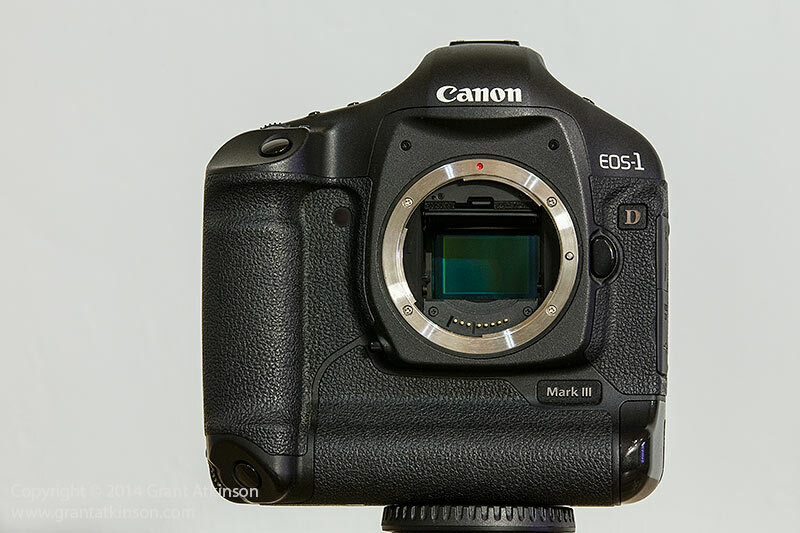 The 1Dmk3 will not accept Canon’s EF-S lenses, those marked with a white mounting point indicator. This particular sensor is made up of 10.1 megapixels. By 2014 standards, this is a rather low pixel count, and it is an area of concern to many potential users of the Mk3. For my own use, 10.1 mp provides enough resolution for most wildlife photography requirements, including publication in high-quality photographic magazines. It is not ideal when shooting for very large prints though, and I prefer using cameras with higher resolution when I can. Also, 10.1 mp does not allow much leeway for cropping. I try very hard to compose correctly in camera when using the Mk3. For this reason I use a zoom lens on this camera whenever possible to help me achieve good composition in the field. For print I try to not crop images to less than 8mp, although one can crop much more than that for images that will only be used on a computer screen or on the internet. It is interesting to note that if one makes a standard 2 x 3 vertical crop from a horizontal image the result is an image of only 4.5 mp. For a photographer used to the added reach provided by APS-C sensor (1.6x) cameras with their smaller pixel pitches, and who might routinely crop images of far-off subjects to make them bigger in the final image, the moderate (10.1 mp) resolution of the 1Dmk3 may not be the best choice. If you do have lenses that are long enough, or can get close enough to your subject, then this camera provides superb image quality, and it is noticeably superior to any Canon APS-C camera body up to and including the 7D, in my opinion. On the other hand though, even fitting a 1.4x teleconverter to your lens will not quite give you the same reach in pixels as with a 7D using a 300mm fixed lens. The camera has 45 focus points, arranged in a grid that covers a large part of the frame, making it easy to place a focus point where you need it. Of the 45 points, 26 are non-selectable AF-Assist points, whilst 19 are selectable by the user, and they can be grouped or utilized in several ways. The user can select a single point manually, or choose to expand the AF area by one point on each side of the selected point. As the selected point is moved around, the two helper points move with it. The next setting increases the number of helper points all around the selected point. These options are called AF point expansion and basically give you greater AF point coverage. It is also possible to have all points active and let the camera choose, though I seldom take this option. Most of the time I use a single manually selected AF point. All 19 of the selectable AF points are f/2.8 sensitive, which means that all of them will offer faster and more accurate AF performance when the camera has an f/ 2.8 lens or faster lens attached. These 19 points are also all cross-type when an f/2.8 or faster lens is fitted. 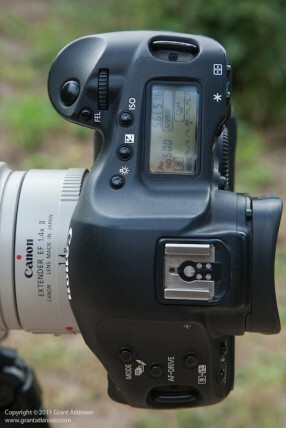 Compare this to Canons mid-level DSLRs like the 5Dmk2, and the 7D, which have only a single f/2.8 sensitive AF point. The centre point in the 1Dmk3 AF cluster differs from the other 18 points in that it has a larger focusing line width, and it will offer high-precision cross-type focusing even with an f/4.0 lens. It will also carry out horizontal-line sensitive focusing with maximum lens apertures up to f/8.0. This can make a used 1Dmk3 a good choice if you are looking to shoot with the popular Canon EF 100-400L f4.5-5.6 IS combined with a Canon EF 1.4x extender, as that combination will still autofocus with the centre point, with this body. There are a number of ways of selecting the desired AF point. Pressing a button on the upper back of the camera activates the control dial, and rotating it will cycle the active AF point through the grid. I prefer making use of the multi-controller which allows me to instantly select any of the 19 points merely by rocking the switch in the direction of the AF point. In order to enable the multi-controller, first set C.FnIII:9 to 3 (19 points), then C.FnIII:11 to 0, then C.FnIV:10 to 0. There is no initial button to press, just touch the shutter to activate the camera, and move the multi-controller. I have found this the fastest way to move around the AF grid, and this is something that I do a lot whilst shooting wildlife. I set up all my Canon dslrs in this way. When the subjects are moving, I find it most valuable in a camera to be able to activate the focus point I want to use as rapidly as I can. I shoot almost exclusively with my camera set up in Ai Servo, and most of the time I use a single AF point, manually selected by myself. There are a number of custom functions that allow the user to fine-tune the camera’s AF system for specific shooting situations. One of these is Autofocus Sensitivity, Custom Function III:2. This setting controls how long the camera will ‘wait’ when the selected active AF point falls off the target before trying to refocus. It can be particularly useful when shooting moving subjects against a busy background to choose one of the settings on the “Slow” side of the scale. In such instances I will set the AF Sensitivity (C.FnIII:2) to either 0 or the setting in-between 0 and Slow. This setting depends on what I am shooting, how fast it is moving and how similar the subject tone and brightness is to the background. The more similar the subject is when compared to the background, the more likely it is that I might lose focus when and if I momentarily move the active AF point off of the subject, so choosing a slower setting tells the autofocus to wait a little longer when focus is lost, before trying to refocus. Hopefully during that period I am able to reposition the active AF point on the subject again and continue tracking. With easier autofocus situations, like birds flying in a blue sky, I would choose 0. 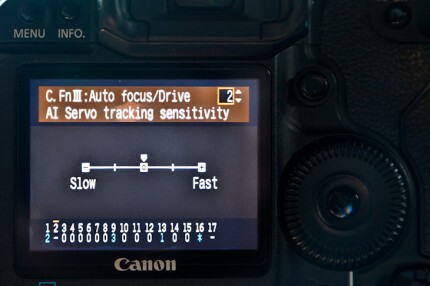 To get the most out of the autofocus system, it will benefit the user to make themselves familiar with these settings by practicing with different settings, and selecting settings to suit specific situations. 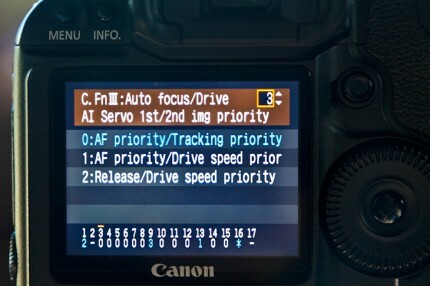 Another important AF custom setting to take note of is Ai Servo 1st/2nd image priority, Custom Function III:3. The camera allows the AF unit a certain, standard amount of time to perform focus calculations. This standard amount of time is usually enough for most focus situations that the camera has to deal with. This custom function allows the user to select an option which extends the time that the camera allows for autofocus to take place, which may result in more accurate focus results. The Mk3 has three different options of combining these two different time allowances. I find that I use (C.FnIII:3 set to 0) most of the time on the Mk3. If you select the first option 0: AF Priority/Tracking priority, the camera will allow the extra period of time for the AF to find focus. It will do this for the first shot you take, and for all those that follow. This should in theory improve focus especially in tough autofocus situations where the background and the subject are similar in tone and brightness. Be aware though, that this setting can slow down the frame rate, which might mean that you take fewer shots of an action sequence. Also, because of the extra time allowed between shots, it can sometimes cause a very slight pause as the camera tries to focus, and it can almost feel as if the shutter release button isn’t working for a moment. 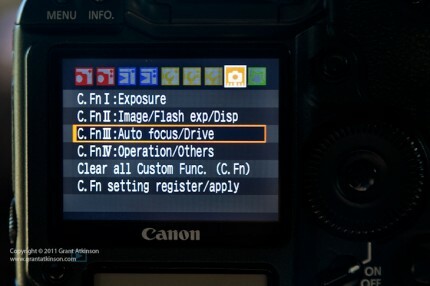 If you choose Custom Function III:3 option 1 AF Priority/Drive speed Priority, the camera will allow the extra time for the first shot, then for the shots following it will allow only the standard, shortened time period for AF to take place. It will still try to attain focus between each shot, but for only the standard time period. Custom Function III:3 option 2 is Release/Drive Speed priority. When this option is selected, the camera will allow only the standard time for autofocus to take place between each shot. The camera will take the first shot as quickly as you can press the shutter, and all those that follow. In this mode the Mk3 can attain 10 frames per second. This option will enable rapid bursts and I often use this setting in easier autofocus situations like a large bird in a blue sky or similar. Get familiar with these settings and make use of the setting that works best for you, given different focus situations. The camera also has an AF Micro Adjustment feature, which allows users to fine tune up to twenty lenses for the camera body by making careful adjustments to the focusing distance. Once the adjustment is made the camera will remember a specific lens. The 1Dmk3 is a very rapid-reacting camera, with almost zero shutter lag, and very little mirror blackout. Bursts shot at 10 fps are incredibly fast, and it becomes important to keep a watch on the buffer (there is a constant readout in the viewfinder), as it is possible to fill it in a short time, due to the high frame rate. The camera has two card slots behind the spring-loaded door. One slot takes a CF card, the other an SD card. It is possible to set up the camera to copy the images onto both cards, or one can save raw images to one card, and jpegs to the other. The speed of this camera means that cards with transfer speeds of around 40Mb/s are a minimum requirement if you want it to perform to its maximum speed potential. The buffer shows up as 24 when the camera is set to shoot raw images only, at iso 400. My cameras do most of their work shooting African wildlife in an environment that can be tough for a camera to survive in. Dust is ever present, especially in the dry season. I try very hard to minimize changing lenses in the field to prevent dust getting into the camera body. To this end I will make use of two or sometimes three bodies when in the field. I find the 1Dmk3 to be about average at remaining dust-free in its internal spaces. Although it does have a self-cleaning sensor I still find I have to blow the sensor clean about once every three weeks, depending on the time of year. I also find the odd dust particle turning up on the focusing screen, and these particles can be seen when looking through the viewfinder. It is easy to gently blow them off using a hand blower, and although they are irritating to look at when seen through the viewfinder, they do not show up on the image. Battery life is exceptional, and the LP-E6 battery will usually easily provide power for over 2000 raw shots on a single charge. The battery level shows up in the viewfinder, and the menu provides a remaining charge percentage as well as a shot count per battery readout. The charger that comes with the camera can hold two batteries, and will charge them successively, taking about 90 minutes to get a completely flat battery from empty to full. The camera can make sound recordings, useful for dictating names of subjects that might be hard to remember later. The rear LCD screen is only of average quality compared to new models, which can make it a little more difficult to evaluate images on the screen. Shooting in bursts can rapidly fill the buffer, when shooting RAW images. The EOS 1DMk3 is an excellent camera for wildlife and sports despite its age, although it does show some limitations. From the minute you pick it up, it just feels as if it was designed to help you get good shots, and its’ fast autofocus, and rapid response make it a great tool for action photography of any kind. 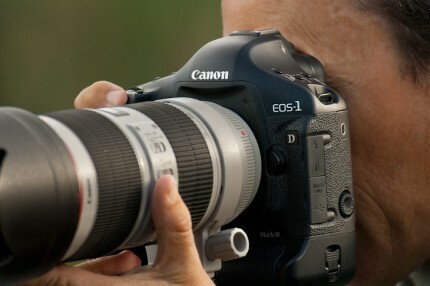 At the time of writing, this camera is surpassed for action photography by the 1Dmk4, the 1DX, and Canon’s 5Dmk3. Despite that, it offers very good value for money on the used market, and is an excellent camera, particularly for those shooters who can live with the modest image resolution.